Creating your own recipes can be daunting, but using a neutral flavored base is a great way to learn how to play with flavors. Rice, chicken, potatoes. I like to get creative with risotto. There’s something therapeutic to me about stirring a pot of soon-to-be-creamy Arborio rice. I planned to make this dish the first Friday of Lent as a way to “sweet talk” my husband. As he isn’t Catholic, I don’t force upon him a fast or expect him to abstain from meat on Fridays. But if we’re eating in, we’re having either seafood or a meatless entrée. Most often I’ll make pasta, and brown up some meat or grill some chicken for him. We ended up ordering pizza that Friday instead so this risotto became a beautiful “fancy” side dish to some baked chicken on another night. I wouldn’t recommend using this recipe as your main dish anyway. 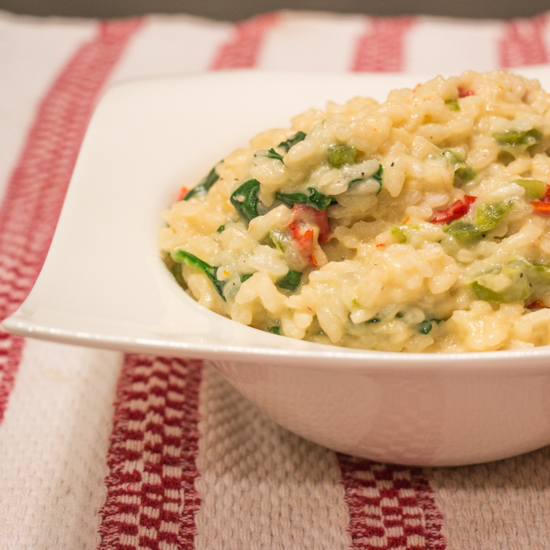 Now that I think about it, risotto isn’t often, if ever, served as a main dish – unless it has meat in it. Bring chicken broth to a simmer over low to medium heat. In a large pot (I use a dutch oven) saute onion and bell pepper in olive oil over medium-high heat. Season with S+P. When onion is translucent add garlic and stir 30 seconds. Add rice and toast 2 minutes. Deglaze the pan with vegetable stock or white wine. Use a wooden spoon to scrape any brown bits from the pan. Once liquid is absorbed add 1-2 ladles of warm chicken broth. Stir often. Once liquid is absorbed repeat until rice is tender and creamy. You may not need all of the chicken broth. 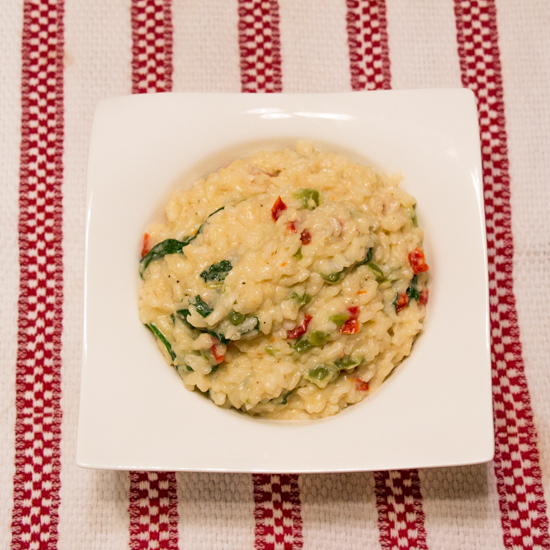 Once rice is cooked through reduce heat to low and add tomatoes, spinach, mascarpone, and asiago. Stir until spinach is wilted and cheese melted. Squeeze with lemon and serve.